In June, we released the HTML5 Video Player for Mac OS. 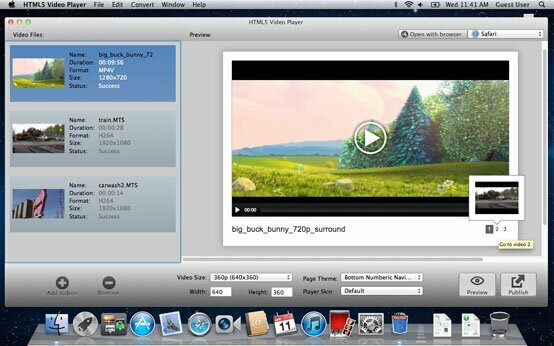 It is a HTML5 video tool to help Mac users to convert and encode their videos to the native HTML 5 video formats. This HTML5 video converter and encoder software can easily convert your source videos into HTML5 format and embed them into your website pages in a few clicks. We received a lot of positive feedback from customers who were looking for an HTML5 video solution in a very short time, saying the HTML 5 video player & converter saved their much time on the video encoding and deployment into their video website. What makes it stand out from traditional Flash videos is that almost all users find it much more user friendly and much easier to use. No coding knowledge or any learning curve needed. HTML5 Video Gallery is a great way to showcase your videos in a nice sliding manner. This Mac version HTML5 video software has embedded several classic video galleries in its first version with more gallery and templates to come in the future upgrade. A video gallery is great when you have multiple movie or video clips and want to demonstrate on your HTML 5 websites. Do not forget that HTML 5 videos are mobile friendly too. Here we list some HTML5 video gallery templates come with the HTML5 Video Player Mac V1.0.0. How to use HTML5 Video Player on Mac? We made versions for both Windows and Mac OS users. You can download the HTML5 video player for Mac here.